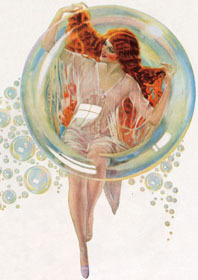 This lovely and artistic representation of a jubilant woman having just washed her hair is from 1922. This lovely and artistic representation of a jubilant woman having just washed her hair is from 1922. I would certainly buy any shampoo (of which this was originally an advertisement for) that this beautiful redhead washed her hair with! Blank Notecards: Our blank notecards are custom printed at our location in Seattle, WA. They come bagged with an envelope. We love illustration art from old children's books and early, printed ephemera. These cards reflect this interest in bringing delightful art back to life. Posters: These prints are made at our location in Seattle, WA. They have a thick, white backing board and are sealed in clear bags. Each is suitable for framing at 11 inches x 14 inches or can be used as is for wall display. Our goal is to bring back to life these wonderful illustrations from old-fashioned, children's books and from early advertising art.